Covers Iseo Town, Sarnico, Riva di Solto, Lovere and Pisogne. Information includes hotels, dining out, transport, and also provides a map showing the lake and region. Well worth a visit! 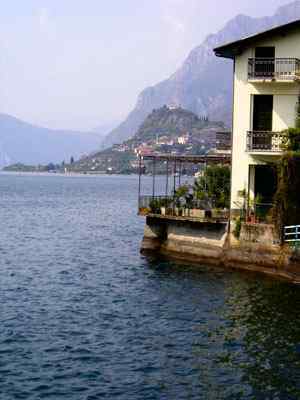 I had never heard of Lake Iseo before I visited the Bergamo area, in the Lombardy region of northern Italy, in January 2004. When I later read about it in booklets I picked up at Bergamo airport tourist office, I resolved to visit the area soon as it sounded so lovely. As a result, I found myself on the shores of Lake Iseo in the following April. It was quite enchanting and I was fascinated to read about the Lake's literary connections. I think that the charm of the lake is aptly evoked in Edith Wharton's short story The Confessional. This is the story of a priest from Lake Iseo who has been exiled to the USA, talking about his homeland, "You will understand why it (Lake Iseo) always used to remind me of the "garden enclosed" of the Canticles. I looked down at the blue lake far below, hidden in its hills like a happy secret in a stern heart. We were never envious of the glory of the great lakes. They are like the show pictures that some nobleman hangs in his public gallery; but our Iseo is the treasure that he hides in his inner chamber." Wharton's story makes an interesting read about patronage, the unification of Italy, family tensions and religion. Edith Wharton was an annual visitor to Italy over a period of many years. She is credited with being one of the finest travel writers with her impressive knowledge of Italian art, history and culture. This is particularly evident in her book Italian Backgrounds. In the second chapter she describes her visit to the towns and lakes of northern Italy, including the Val Camonica and Lake Iseo. In the epigraph to chapter two, the first two lines of Claire de Lune by Paul Verlaine are quoted. They draw comparisons between the soul of a poet's loved one to a 'chosen landscape', charmed by strolling players, in the tradition of commedia dell'arte. This device is utilized in Wharton's description of Lake Iseo. She portrays the lakeshore villages as the setting for such improvised comedies, the characters speaking with the guttural Bergamasque dialect. She believed that the lake was reminiscent of scenes portrayed in the Rococo style, by painters such as Longhi and Tiepolo. "As if some magic crystal lay beneath the waves, waiting to e discovered by some later traveller. The atmosphere blurred the distinction between fact and fancy, under the spell of Italian midsummer madness." The English writer and poet, Lady Mary Wortley Montagu, spent more than ten years in Lovere, on the north west bank of Lake Iseo, between 1746 and 1759. She purchased a villa on the banks of the lake but only renovated six rooms to live in and left the rest of the villa to the mice. Lady Mary is said to have written many letters to her daughter in the villa garden, and been inspired to write poetry by the beauty of her surroundings. In fact she declined an invitation to the Venice carnival saying, "there are plenty things to do in this village which, by the way, is one of the most beautiful that exists." She commented on the emergence as Lovere as a holidays destination, "It may be because of the pure air you breathe that important people pass their summer holidays here to drink these healthy waters, leading wealthier people to embellish certain buildings to use as hotels." She wrote the following poem at Lovere in 1755. It seems to me that she was beginning to ponder her own mortality and what mark she may have made during her lifetime. However in retrospect she would have probably been content having achieved literary fame. By the fierce storm of passion torn away. No sooner born than the poor planter dies. Lady Mary was an Earl's daughter, born in 1689. She had been fascinated by literature since an early age. She was competent in Latin, Italian and French. Her future husband, Edward Wortley Montagu, was impressed by her ability to quote Horace. Her father tried to marry her off to a wealthier suitor but was thwarted when she eloped with Montagu. Her husband travelled with Joseph Addison in Europe for two years. Montagu did not subscribe to the view that women should be pretty ornaments and he suggested that she act as a critic to Addison's Cato. She was privately scathing of the plot and, in fact, Addison did follow most of her suggestions. In 1714 the Wortley Montagus moved to London, when Lord Montagu was appointed Lord of the Treasury. Lady Mary quickly became a big hit in society and mixed with Gay and Pope. Her husband was then posted to Turkey as British Ambassador. There she came across the practice of inoculation against smallpox. She had her own children inoculated but was never given proper credit for introducing the practice in Britain. On their return to England Lady Mary became close friends with Lord Hervey, a bisexual. Pope caricatured Hervey as Sporus, the young male slave castrated by the Emperor Nero and then taken as Nero's wife. Some of the antagonism between Pope and Hervey may have emanated from Hervey's marriage to Mary Lepell, as Pope was also interested in her. This very public poetic slanging match between Pope and Hervey impinged on Lady Mary when her husband was portrayed as a cuckold. It was decided that Lady Mary was tarnishing her husband's reputation and should be exiled abroad. Lady Mary's daughter married Lord Bute, who became prime minister of Britain in 1762, a year after Lady Mary's death. Lovere has another literary connection in Georges Sand, the French novelist, who wrote of Lake Iseo to a friend in London, "Come, I have found a lovely place to live." Georges Sand's real name was Aurore Dupin, but she had taken a man's name as it was not deemed suitable for ladies to be novelists in the 19th century, and she often dressed as a man. She had a long-standing affair with Chopin. Lucasta Miller describes their relationship in the book Chopin's Funeral. Chopin's relationship with Sand was the most meaningful of his life. Chopin's family were Polish exiles living in France. Chopin was a child prodigy who, at the age of eight, was being called the second Mozart. It appears he never really matured and under the veneer of aloofness was really insecure and searching for constant mothering and reassurance. Sand seemed to fulfil this role in his life. She was older than him, very confident with a larger than life personality. She nicknamed Chopin her "little Chip-Chip." During their ten-year affair (1838 - 1847) she provided a quiet working haven for Chopin at the family home, Nohant, which she had inherited. She also managed his career. Sand had two children from her earlier marriage. She had left her husband but divorce was not an option. Evidently she did not have a good relationship with her daughter Solange. Chopin tried to intervene to shield Solange against her Mother's enmity. Sand was enraged by this and coupled with Chopin's failing health, and an insinuation that Chopin had fallen in love with Solange, the relationship ended. During the final stages of their tortured love affair she wrote the novel Lucrezia Floriana. This is a romance between a young moody introspective nobleman, Karol (based on Chopin) and an older lady, Lucrezia, who is an actress and Mother (based on Sand), is set on Monte Isola, the island in Lake Iseo. 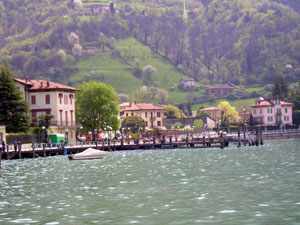 Lake Iseo is described as beautiful as an eclogue of Viirgillio. An eclogue is a short descriptive poem in the form of a personal letter intended for public reading set in an idyllic rural or pastoral life. Virgillio is best known for the exchange of eclogues with Dante. In the novel, Lucrezia dies smothered by Karol's increasingly unreasonable emotional demands. Sand publicly read the book aloud in Chopin's presence and Chopin did not recognize this obvious unflattering portrayal. It is said that this novel inspired many visits by ladies seeking romance to the area! I discovered that Edith Wharton was fascinated by George Sands and visited Sand's home, Nohant, during her 1907 motoring tour of Europe. In Pisogne, the northeastern bank of the lake, the facade of the Palazzo Fanzango is adorned with medallions depicting the characters from the book I Promessi Sposi of Manzoni written by Manzoni between 1821 and 1825. This is an important piece of Italian literature, telling the tale of how love triumphed for two peasants despite the efforts of a local tyrant. Two villagers, Renzo and Lucia, are about to be married when the Don Rodrigo, taking a fancy to Lucia, threatens the village priest into refusing to conduct the marriage. As they flee from the village they are separated and drawn into the Thirty Year War in Milan. The book also has a vivid description of the spread of the Plague in 17th century Milan. Manzoni continued to revise the book and in 1840 published a version in Tuscan Italian. Manzoni died in 1873 and Verdi composed the Requiem for the first anniversary of Manzoni's death. I would say that for a small lake so overshadowed by it's neighbours Lake Como and Lake Garda, Lake Iseo has a rich literary history. However it is almost impossible to fully evoke its charisma and loveliness in words and photos. Better to visit in person! The above links to an article about Lake Iseo by Lee Marshall. If you enjoyed reading the above article then you will probably also enjoy Mecklenburg-Vorpommern in Germany by Karen Bryan, and Irish Republic, also in Europe, and our latest articles covering the Orinoco Delta, La Mata, Marbella and Beijing.